This week we're featuring two books from Beyond Words, Sam Abell's 'Seeing Gardens' and Peter Niedermeyer's 'Appearances'. Abell's other book credits include Contemplative Gardens, The Inward Garden: Creating a Place of Beauty and Meaning, Australia: Journey Through a Timeless Land, and Stay this Moment (The Photographs of Sam Abell). In 1998 he collaborated with author Stephen Ambrose on Lewis & Clark: Voyage of Discovery and again in 2002 on The Mississippi: River of History. That same year, he worked with author Leah Bendavid-Val to produce a retrospective of his life and work titled Sam Abell: The Photographic Life. You can buy 'Seeing Gardens' at Beyond Words (http://www.beyondwords.co.uk) for a discounted price of £10 using this link. Hmm... if the text is meant to evoke alienness I think it worked. There seems a disease at work in contemporary photography that has supplanted rational discourse and substituted some sort ballistic mash up between beat poetry and Roget's thesaurus. I came away from reading the two essays at the start of the book wanting to take a scalpel to the whole introduction, ensuring no-one else has to suffer. Now onto the pictures (at last). 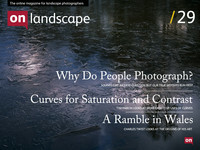 As you can imagine from the type of introductory text, this isn't your average romantic landscape photography book. Walter Niedermayer's images have a little bit more sense to them than I could extract from the text though. He uses a combination of straight, single photos with diptychs, triptychs and many more tychs in order to create a rhythm throughout the book. The initial images are all taken on ski slopes or glaciers, all high key and of a consistently green-cyan palette that continues past the snow pictures and into his architectural and interiors of hospitals and airports and then onto a series of almost burnt out images of Iran. The connections between these images is about as clear as the introductory text though, my interpretation is of a sense of disconnection with the world, the way the world looks when you walk out of a dark room into a sunny day, almost painfully bright and robbed of colour. Interestingly Walter works a lot with architects who share his vision of simplification - rendering the world has a reduction of colour and form; the typical white buildings and rooms that are part of the book looking like modern art galleries themselves. Later pictures are off the heart of a developing Iran and I can't find the connections here. From his PR comes this though - "Like SANAA [the archtects he works with] Niedermayr is concerned with a distinct kind of light and whiteness that leave it to the perceiver to ascribe meaning to the photo" - I do wonder at statements like this though. Isn't it the photographer's job to communicated something? The book is full of interesting ideas in pictures - the use of panels of images that suggest a narrative flow, almost like photo comics, is definitely interesting - but I can't seem to engage with the whole in any way. Call me a cynic but his topographic style, close association with professional architects, visits to 'controversial' locations like Iran and 'art installations' with video and audio all seems like a planned strategy for success in the contemporary art world, especially one obsessed with New Topographics. A sum of parts that meet a certain expectation. Looking at the work as a simple series of photographs does work though, they are undoubtedly of a unique look and many are quite beautiful. However cynical I get, the photographs do work, if you like that sort of thing, especially those of the snowy mountains where his obvious relationship with the location is reflected in his creative interpretations. The combination of these with the architectural photographs and the topographic photographs of Iran just seems a little forced.